Home / Baseball / THE DARK KNIGHT (Harvey) WINS–AGAIN! Queens, New York, May 1, 2015 – Matt Harvey continues to rise to the occasion and save the Metropolitans from mediocrity as they beat the Washington Nationals, 4-0. The Mets were (13-3) once upon a time until their recent woes brought them back to reality. The Mets coming into today had lost 5 of 7 and were on a 3-game losing streak. Having lost the last series to the hot Miami Marlins and the opener of their series with the Nationals, the Mets were happy to have Harvey pitching. Harvey pitching to the Mets is like the weekend to us; we just cannot wait until the day arrives. And for the Mets, Harvey Day could not have been any sooner. In Harvey’s latest start, he pitched 7 innings of shutout baseball with 1 walk and 3 strikeouts outdueling another one of the best pitchers in the game in Max Scherzer. 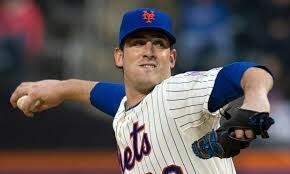 Harvey is now 4-1 with a 0.94 ERA and 0.74 WHIP when facing MLB pitchers who have won 20 or more games. If that is not enough, Harvey became the first player in the majors with five wins this season, and is the second Mets pitcher to start a season at 5-0, matching a Hall of Famer by the name of Pedro Martinez who accomplished the feat in 2006 which was the last year the Mets made the playoffs. Harvey is a freak for an athlete after tearing his (UCL) in 2013 and rehabbing all of 2014. He is back and perhaps as good as he was then, if not better. He has been able to maintain his velocity throwing his fastballs above 95mph and mixing his sliders and curveballs having hitters fooled and off balanced which is why he is off to a fast start. Another reason is the defense. Juan Lagaras had another remarkable play in center in the fifth inning that saved a run and helped preserve the 1-0 lead Michael Cuddyer gave Harvey in the fourth with his HR to right field. Moving in the fences has been able to pay dividends for the Mets thus far as they have been able to capitalize on numerous occasions with homeruns. Cuddyer’s homer was a prime example because in last year’s ballpark dimensions, his homer would have been a double at best. Murphy was able to pad a narrow 1-0 lead in the bottom of the 8th when he had a bases clearing 3 run double that went over the head of Jayson Werth. Werth seemed to have tracked the ball but lost his footing which doomed not only him but the Nationals helping the Mets take a 4-0 lead which was more than enough for reliever Jeurys Familia. Familia recorded his 10th save of the season with a 5-out save. He was asked to come in in the 8th inning taking over for Torres. Familia has been lights out this season going a perfect 10 for 10 in save opportunities, with a 1.46 ERA. Familia and Harvey were all the Mets needed as they delivered a nice one-two punch to shut out the Nationals for their 16th win of the season and an 11-1 record at home.